Authentication is the act of verifying a user's identity based on the credentials that they have presented. Establishing each user's identity is a critical first step in any client/server based system. In this IBM® Redbooks® publication, we present an overview of the set of authentication options in the IBM FileNet® P8 V4.0 release. The two standards at the core of the authentication process in IBM FileNet P8 V4.0 are the Java™ Authentication and Authorization Service (JAAS) standard and the Web Services Security standard (WS-Security). The JAAS standard forms the framework for security interoperability in the J2EE™ world, while the WS-Security standard forms the framework for security interoperability in the heterogeneous world of clients and servers that communicate through Web services interfaces. IBM FileNet customers rely on a variety of authentication technologies to secure their corporate intranets. By implementing and adhering to these two standards, IBM FileNet P8 V4.0 enables a wide range of authentication integrations. 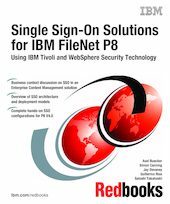 In this IBM Redbooks publication we discuss and demonstrate the IBM FileNet P8 integration with IBM Tivoli Access Manager for e-business, IBM Tivoli Federated Identity Manager, and the SPNEGO mechanism provided in IBM WebSphere Application Server. This book is a valuable resource for security officers, access management administrators, and architects who wish to better understand single sign-on options for the IBM FileNet P8 V4.0 solution. The re-publication from 24 November 2009 includes some error corrections and clarifications. No new content has been added.